If you haven't used RPT before, you may occasionally encounter problem recording your network traffic. This might be due to your proxy setting on IE. The issue will normally occur before you even start to record. 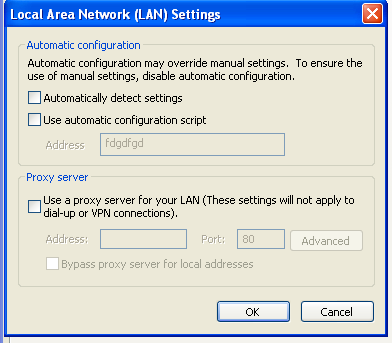 If you are not recording traffic through proxy server(connecting directly to internet), make sure you have following options unchecked in IE (LAN Setting). If you want to record using a proxy setting. I suggest using proxy server and port option rather than using proxy.pac file. This is what the IE setting should look if you are trying to record via a proxy server. Make sure you are not changing these setting while you are trying to record. The changes may not come into effect when you try to record again. Therefore make these changes before you start to record. Click Start > Run > regedit. In the Registry editor window, click My computer > HKEY_CURRENT_USER > Software > Microsoft > Windows > CurrentVersion. In the right-hand pane, verify that the value of ProxyEnable is 1.